Chinese authorities have shot dead at least 15 ethnic Uyghurs in a desert area in Xinjiang, accusing them of terrorism and illegal religious activity, in the latest violence to rock the troubled northwestern region of China, according to police sources. 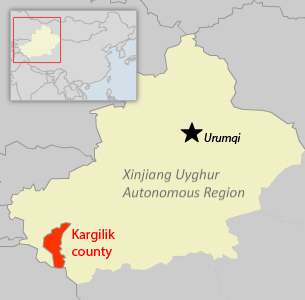 They were among a group of more than 20 Uyghurs surrounded and fired upon by police in a lightning raid last week in the Yilkiqi township in Kargilik (in Chinese, Yecheng) county in Kashgar prefecture, the sources said. “We conducted an anti-terror operation on August 20th, successfully and completely destroying the terrorists,” Yilkiqi township police chief Batur Osman told RFA’s Uyghur Service. He refused to give the number of Uyghurs killed in the shootout, saying many of them were from out of town and some were not carrying identification documents. Chinese authorities usually blame outbreaks of violence in Xinjiang on “terrorists” among the region’s ethnic minority Muslim Uyghurs, but rights groups and experts say Beijing exaggerates the terrorism threat to take the heat off domestic policies that cause unrest or to justify the authorities’ use of force against Uyghurs. One of the police assistants at the Yilkiqi police station told RFA that among those killed were at least 15 Uyghurs and one Han Chinese policeman. “We police assistants were not sent to the scene, but I heard from others who were there that 16 people had been killed, among them a Han Chinese policeman,” said the police assistant, identifying himself only as Alimjan. He said that six knives and axes had been recovered from the scene. An RFA listener, citing contacts in Yilkiqi, his hometown, said he was told that police opened fire on a group of 28 Uyghurs they believed were undergoing terrorism training and that those killed at the scene were buried on the spot using excavators. A Yilkiqi resident said that police on Saturday searched the house of his neighbor whose brother was implicated in the incident and that he overheard that 26 Uyghurs had been killed. The figure could not be independently confirmed. “From what I heard, those killed were the ones who were renting [my neighbour] Memet Emey’s brother’s house in Seriq Ata village,” the Yilkiqi resident said, speaking on condition of anonymity. “When they gathered in the desert and were praying together, they were surrounded and fired on. There were 26 people there and all of them were killed. The police, instead of carrying the bodies to the village, buried them all in the desert using a bulldozer,” he said. Yilkiqi local government officials said security has been beefed up to prevent what they call retaliatory attacks from Uyghurs angered by the shooting. “Since what happened on August 20th, we have been standing on guard at the government buildings,” Ablet Abdulla, a government official told RFA. The Yilkiqi incident follows a spate of violence across Xinjiang in recent months that has led to a crackdown, with hundreds of Uyghurs detained for questioning by the authorities. Nearly two weeks ago, a Uyghur religious leader was stabbed to death after returning home from leading evening prayers at a mosque in Turpan city in Turpan prefecture. He was targeted by members of his own community for branding Uyghurs as “terrorists” and backing a government crackdown against them, residents and officials said. In early August, police opened fire on a crowd of Uyghurs protesting prayer restrictions in Akyol town in Aksu prefecture ahead of the festival marking the end of Islam’s holy month of Ramadan, killing at least three and injuring about 50 others. In June, up to 46 people were killed in Lukchun township of Pichan county in Turpan prefecture after police opened fire on “knife-wielding mobs” who had attacked police stations and other sites in the county, in the bloodiest violence since the July 5, 2009 unrest in Xinjiang’s regional capital Urumqi that triggered a massive crackdown. Also in June, in Hotan prefecture’s Hanerik township, police fired on hundreds of Uyghurs protesting the arrest of a young religious leader and closure of a mosque, officials said, acknowledging that up to 15 people may have been killed and 50 others injured. Reported by Shohret Hoshur for RFA’s Uyghur Service. Trranslated by Mamatjan Juma. Written in English by Parameswaran Ponnudurai.